There’s a spiky, leggy, bush / shrub which has been in our front garden since before we moved in. It’s flowering at the moment - beautiful bright pink, waxy flowers. It’s never had any fruit but I’m wondering if it could be a quince. Any ideas? Great idea. I always need inspiration and jealousy of other people's gardens works for me. I immediately thought of a quince when I saw that. I'm pleased that I have a white hellebore in my garden and a honeysuckle in flower. I'll take a couple of pictures tomorrow. I really like the idea that we are starting our own threads! That plant is chaenomeles japonica and yes, a quince. Although it’s ornamental you can use the fruit in the autumn. Lovely plant. I just noticed we’ve got crocuses in flower. I’ve managed to naturalise a large patch under trees and they have self seeded so they will be quite spectacular in a few weeks. The squirrels even leave them alone now. I think that's a japanese quince which is grown more for its ornamental value than the fruit. A true quince has larger, paler and less waxy flowers, which are in bloom a bit later than January. Does it fruit at all and if so have you used it for anything? This thread is an excellent idea as a companion to the other one which is just about things we are growing to eat. This thread is more general so more useful in many ways! It sounds very early for honeysuckle as well, very cheery though, you are lucky PL! When I get back to Portugal I am hoping to see my camellia in bloom; the only thing out in my Mum's garden are some snowdrops. Hopefully all 3 of us can't be wrong with our ID! I use the fruit from ours every year. Don’t peel it because it’s so hard, just stew it whole with lots of sugar, sieve it and you have membrillo. Or add to apples for a lovely scented apple pie. I thought we were doing well with bluebells coming up in sheltered areas. Used to have a lovely garden but chickens and 5yrs of neglect while I worked 25 hrs, studied 30 hrs and raised to little ones means it’s currently being ripped out and redone. We had a daffodil, we now have the remains of a daffodil. A pheasant chomped it just as it was coming into flower! There are lots of daffs not quite as advanced as that one. But then there are plenty of snowdrops and crocuses in flower. We've had daisies on and off in the grass and a fair few primulas dotted around ever since we moved here! The fuchsia was in flower up until Christmas but it's just starting to lose it's leaves. It knows it's cold! 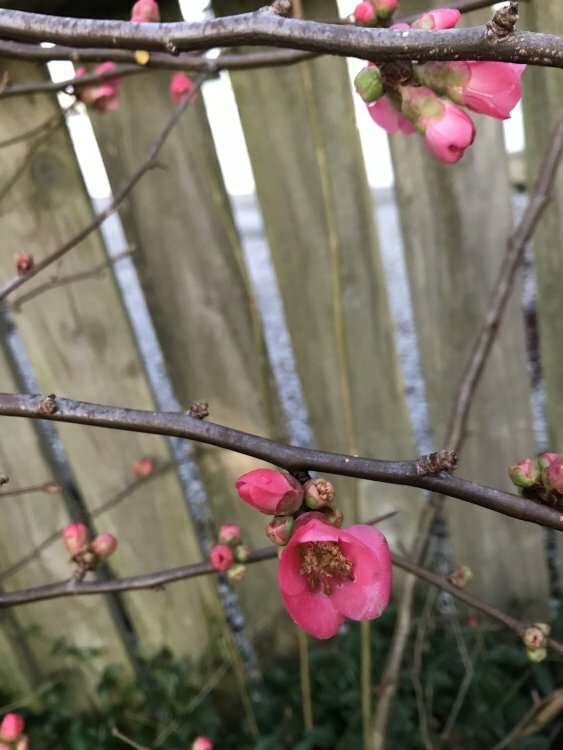 I know we have a quince but it's not in flower yet, nor are the other shrubs apart from the scented viburnum - that doesn't have a scent! I shall have words! Will have another wander round when there is less sleety rainy yukky stuff out there! I'd love to have a proper quince tree - the blossom is so pretty. This is what I think is a honeysuckle. It's popular with big bees when it's cold. I couldn't be bothered to go outside so you can't really see the blossom. Do you think it is actually a honeysuckle? Looks like honeysuckle to me Patsylabrador; the scent will confirm that. We have no bulbs coming up aside from Orchids as it has been rather cold and wet. We have a 'proper' quince tree but, although the fruit is huge and plentiful, the grubs get into them all. All the trees and bushes are still lifeless here, apart from the honeysuckle being visited by a huge fluffy bumble bee. Might all be different in a few weeks? Thankyou all - 3 is good enough for me to be confident that it is a quince 😁 No it hasn’t had any quince on it so far but it’s still only fairly small so we’ll see. In other news I’ve planted a few sweet peas indoors in a windowsill propagator I got for Christmas. Windsor, Nimbus, Heirloom mixed and mammoth mixed - all seeds leftover from the last few years. 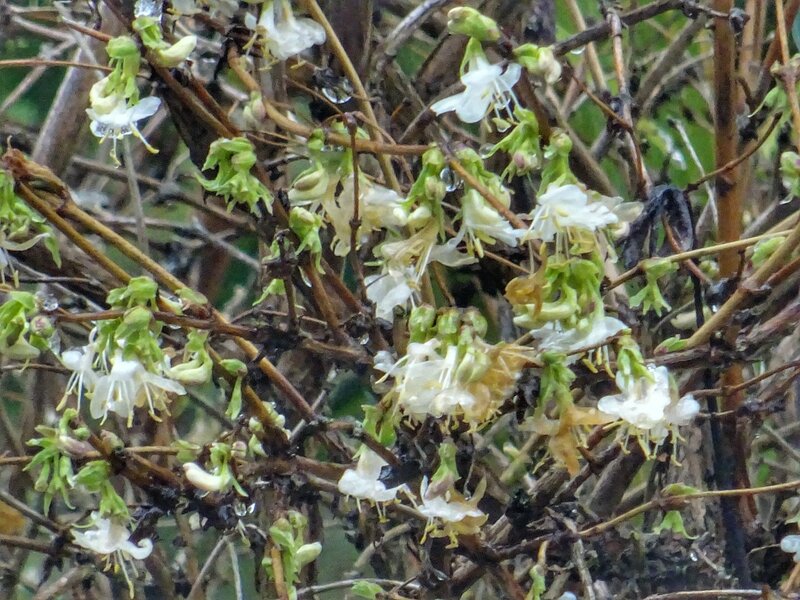 Lonicera fragrantissima! 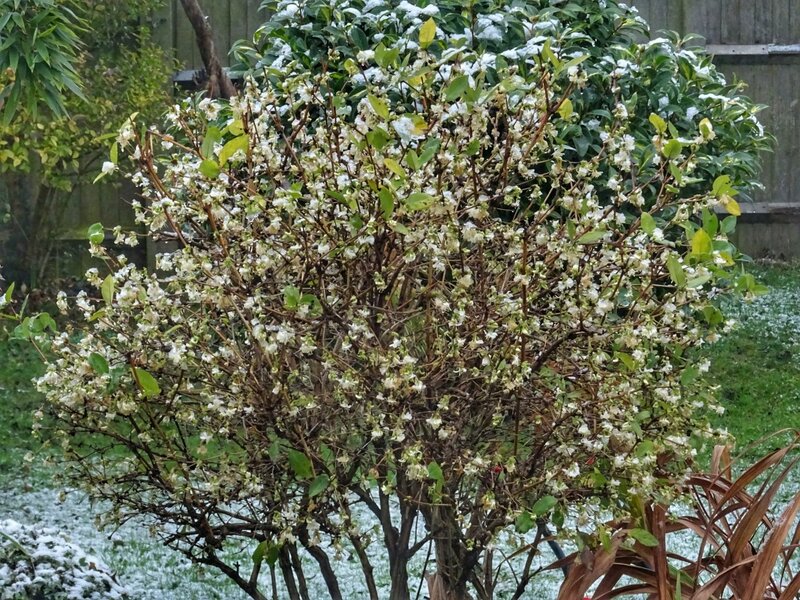 That's winter honeysuckle - I needs one of those! I loves it! I'm wondering if someone has a shrub near here because I had a waft of perfume the other day and I couldn't see anything around that it could have come from! At the moment I'm considering purchasing hedge plants for the field to act as a windbreak of sorts! Eventually - and set inside the fence so that I can go through it to see my pretty sunsets! My dwarf nectarine tree has arrived 🤗 It’s going to live in my new greenhouse! MT - I hope your nectarine thrives; I planted one outside in Portugal last year, but it doesn't seem to have moved at all! Do you know what variety you have? Valkyrie - If you do plant a hedge, I would go for 'whips' which are cheap, but will thrive, given enough watering in and bit of tlc for the first 6 months. We planted 150 mixed whips on a boundary (double row) to keep easterly winds out. They all survived, with a bit of blood, fish and bone in the planting holes, and the odd upturned turf between plants from when I was making a flowerbed, but I did have to cart water to them for a month or two as it was very dry (October). We went for hornbeam and field maple, but be warned, after about 6 years I couldn't manage to keep the hedge under control myself, it now needs a hedge trimmer and someone with stronger arms than I possess. 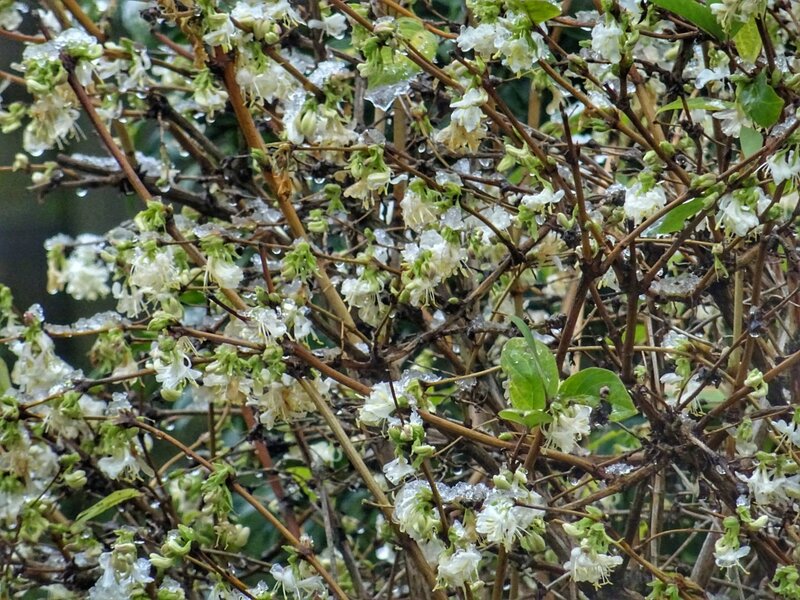 I also personally wouldn't plant blackthorn (we have it on another boundary) as it is so thorny, its a menace to humans and lawn tractor tyres, and it doesn't keep foxy wildlife out either. Hawthorn is quite nice though, and we also have an impenetrable rose hedge which is rampant and wonderfully scented. There is a company in the Netherlands that sells fruit tree hedges. They are a dwarf variety of apple, cherries and pear. It won’t form a dense hedge, but give lovely blossom in spring and lovely edible fruits in autumn. Also today I discovered I haven’t planted all my ridiculously expensive Sarah Raven bulbs that I bought in the autum. Ten dark purple hyacinths (Woodstock) which were already sprouting and ten orange tulips are now in pots. Also have 30 allium bulbs and a load of daffs and narcissi. Oops! I suppose I can shove em all in somewhere and even if they don’t flower this year they will next. We don't have much buckthorn - what is there is very sad and right by the gate, so I would like a few for the sloes (eventually, if I'm still alive by then), hawthorn, spindle - we have another of those near the gate also er, spindly! LOL! But that would be for the birds, can't eat that but it's so pretty! Dogwood, field maple (we had one in the last garden - seeded itself because no other field maples in the area! ), elder, guelder rose, dog roses, perhaps privet, cherry plum, crab apple, hazel and probably some soft fruit bushes too. Mostly windbreak but I like the idea of providing for the wildlife and us too. We would have to put protective collars on because of the rabbits and deer, but the actual veggie patch would have proper deep fencing around to keep them out. I realise it's not going to happen overnight but it's a plan. Also going to increase our orchard. I'd like a pear but they say windy sites not good for pollination - I think the bees pollinated the apple trees exceedingly well - so don't see why we shouldn't try! As for trimming - will flutter my eyelashes at one of the farmers close by! I don't think pears are any more temperamental than apples, so I would deffo give them a go. If you are in it for the long haul you could also plant some perry pears, although I know they take ages to mature. We seem to have an 'iron pear' in Portugal, one of those that never seems to ripen and could be used as a cannonball. I can't get any juice out of it, although perhaps next year I could try dehydrating the fruit or making fruit leather. Does your spindle produce berries - they are beautiful if you are lucky enough to have them, they didn't grow for me. Hazels are very quick growers but I'd be tempted to plant them separately so you can coppice them, although in a hedge you could lay them so that is useful too. It must be fun to plan for such a large plot of land, but a lot of work as well I am sure. My Mum had hellebores in flower just as I left, and a neighbour had crocus, but that was about it, apart from a viburnum bush which was a mecca for the bees. The smell of hyacinths is amazing isn't it, though I know some people find it overpowering. I bought some bulbs in Portugal a few years ago, they took off and grew at a rate of knots, then they got some sort of rot and died so I never did get a flower! I have discovered that hardly any winter bulbs do well in Portugal, they don't get cold enough, so I have abandoned the attempt to grow them. I envy you with those lovely shaggy parrots Soapdragon! Would it be possible to put the bulbs in the 'fridge for a while before planting out? Just a thought as I had some seed ages ago that required a few weeks in the 'fridge before planting to aid germination! Wish I could remember what they were! I absolutely adore parrots; we visited Amsterdam about 18 years ago in the spring and I bought masses of them at the Bloemen market (is that right, CT?) for a fraction of the price in UK and filled the hotel room - much to the receptionist's amazement! We went on a bulb field trip too and the smell from the hyacinth field when the coach door opened was AMAZING! I'd go so far as to say that a Dutch spring bulb field trip should be on every gardener's bucket list; the colours and scents are truly special! I have a big white cyclamen in a pot outside the front door at the moment; I prefer the white as it contrasts so well with the glossy dark green leaves. However, it's wilting in the extreme cold so looking quite sad just now. Yes, the spindle had a few berries on it - which is how I identified it. Near Hook when we did our walks there was a huge hedge along the field where there were mainly spindle trees - had to look them up because I'd never seen anything so pretty! Well, yes I have, but at that moment it was the best plant ever! From a snowy start to a beautiful day we had a walk around the field, discussed the hedging and agreed - apparently I made sense - very unusual, I should have recorded it or got that in writing! Can always do espalier pears. Also had a wander round the garden - we have a witch hazel in flower - so excited as I wanted one of those too. It wasn't scented though. Perhaps it was the snow this morning. Or maybe the scented plants don't smell up here - the viburnum that's supposed to be scented isn't smelly either. 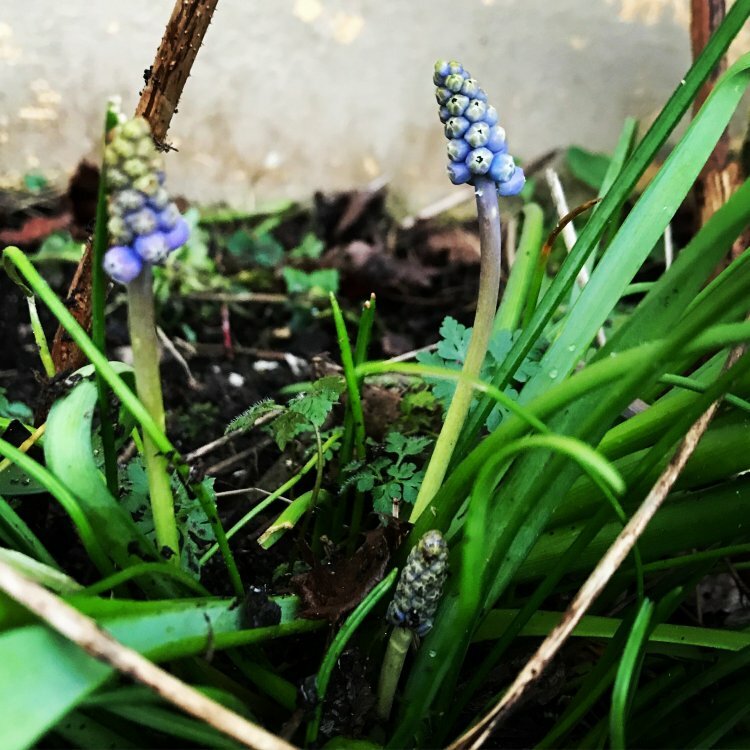 On another plus there are hyacinths just budding at the base of the leaves - ooooh we have hyacinths - wonder what colour they are? Yes! Won’t say bulbs are dead cheap here, but definitely not expensive. Big bag of tulips (50 bulbs) might cost about €10, depending on quality and colour. The more special types will set you back €10 per bulb... not a real fan of tulips. I prefer daffodils, crocuses and alliums. I have never been to the tulip and bulb fields, perhaps I should do it before I die, that's a nice idea, it could be a cheap but fun weekend away. It won't be happening in 2018, but perhaps next year, the colour must be amazing, actually I could take my Mum, she would enjoy it. Thanks for the idea, Soapdragon, I wouldn't have thought of it for myself. I know some seeds do need to go dormant and be chilled before sowing, I am experimenting with some day lily seeds doing just that at the moment, whilst my Mum has sown hers fresh. I think with the bulbs they would need to be actually chilled whilst they are growing, so I'm not sure how to arrange that! OH would take a dim view of pots of compost in the fridge, although a few years ago we did have a small beer fridge so I could have comandeered that, but it broke.